Interconnected devices provide a myriad of benefits for patients, hospitals, and manufacturers. From remote monitoring of patients to the collection and analysis of clinical data, is having a massive impact on Medical Devices. Promenade provides a ready-made, flexible and extensible cloud solution, tailored for the needs of Medical Devices. The Promenade Cloud lets you quickly and securely collect data from your devices and run analytics. Whether patient data, instrument monitoring data, instrument usage data, or consumable tracking, the Promenade Medical IoT solution provides best-in-class security, and connectivity. Do it Yourself: Using the Promenade Cloud is easy. 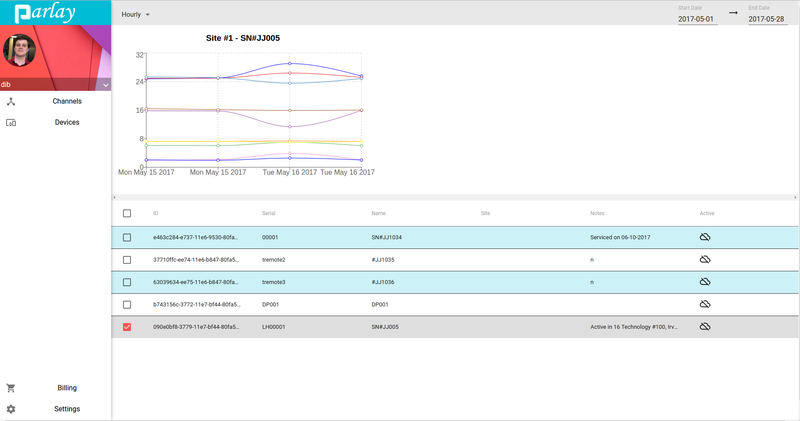 Our secure REST API lets you setup the data to want to collect and organize it for viewing, graphing, and analytics. Need Help? Promenade Software Services are ready to help you get connected with a customized portal for you and your clients. Our experts will implement the solution you need, including account management, device connectivity, and cybersecurity. We can guide you through the regulatory submissions will make sure your solution passes the scrutiny of the FDA Cybersecurity teams, and membership in MedISAO provides the vulnerability monitoring and reporting necessary. All the health provider to remotely set therapies and see when and how they are performed. Gather data on how this particular therapy is used by providers. A HIPAA compliant Parlay cloud was used to implement this project. Patients setup accounts that invited their provider to share information. A device in the market needed remote upgrade support. Field Upgrade, checking the device hardware and software revisions match to the appropriate upgrade. Service personnel use Parlay capabilities to control the system and characterize the problem. Customers could make accounts that would auto-reorder or alert for re-order based on instrument usage.